Finding My Japan. : This post is for Nan! 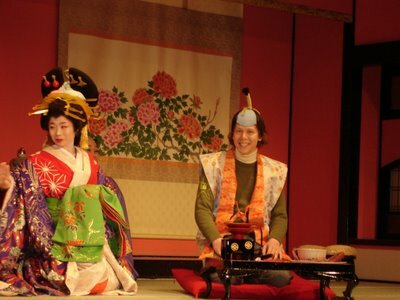 This is a picture from one of the plays I was in at Nikko Edomura. I played the rich man, and all I did was sit there and say a couple lines, which a guy sitting (not seen in the picture) just on my left. Because it was all part of the play, they made me drink real sake on stage! It wasn't bad, but I don't like drinking very much. thank you for the bigger picture, so we can really appreciate your hat. I have been enjoying your new CDs Peter. You take so many good shots. I'm surprised at the ones you get from the tops of buildings. You have some amazing panoramas. Dude! Bless you. I love the poo-eating grin on your face. Larger format, larger grin. Dang, I'll just have to go to Japan again someday, and see the flowers for myself. Maybe they'll give me sake, too. What's the drinking age there? I think your head won that hat war. That thing she's wearing looks really heavy! I am really this dumb?